This special issue explores the question of ethics outside our contemporary understanding of what it means to be human. This question is addressed from a number of theoretical and disciplinary approaches, such as philosophy, ecocriticism, literary studies, black feminist studies, Marxism, psychoanalysis, and anthropology. 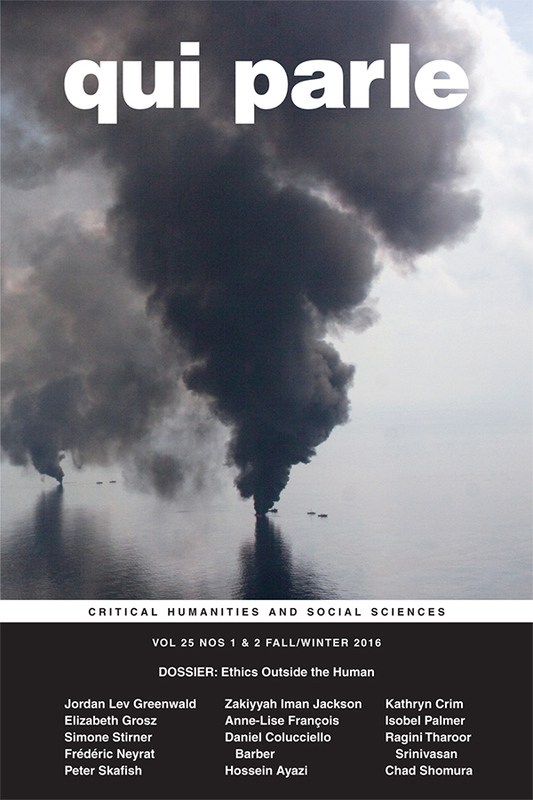 Contributors include Hossein Ayazi, Daniel Colucciello Barber, Kathryn Crim,Anne-Lise François, Jordan Lev Greenwald, Elizabeth Grosz, Zakiyyah Iman Jackson, Frédéric Neyrat, Isobel Palmer, Chad Shomura, Peter Skafish, Ragini Tharoor Srinivasan, and Simone Stirne. View the table of contents for Qui Parle 25:1, at the journal's online site.